GC manufactures about 600 types of products and sells them in more than 100 countries around the world. Due to differing requirements in the various overseas markets, GC has very deliberately localized its European, US, and Asian operations. 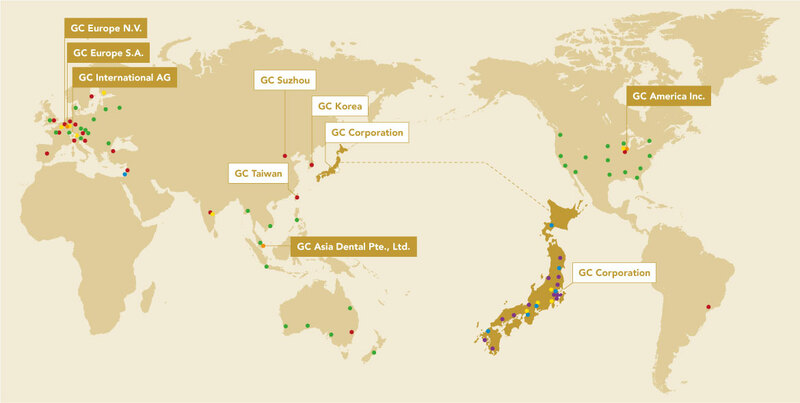 GC has lost no time in optimizing its on-site activities, while at the same time fulfilling its obligation as a local enterprise to actively participate in each country’s dental industry associations. In this way, GC embraces the priority markets of Europe and the US with comparatively large market volumes, but manufactures in optimum locations around the world. It thus accommodates market demand while building a presence in the Chinese and Indian markets, which have firm growth expectations. GC’s three main production centers have all acquired ISO 13485 certification. Moreover, the company is becoming increasingly well known in the global marketplace for the high quality of its products. GC Taiwan, 16F., No.176, Jian 1st Rd., Zhonghe Dist., New Taipei City, Taiwan R.O.C.